In a quadratic equation, the discriminant helps tell you the number of real solutions to a quadratic equation. The expression used to find the discriminant is the expression located under the radical in the quadratic formula! 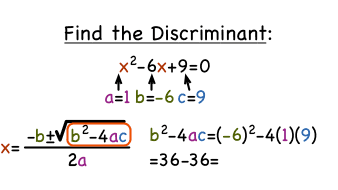 In this tutorial, get introduced to the discriminant of a quadratic equation!